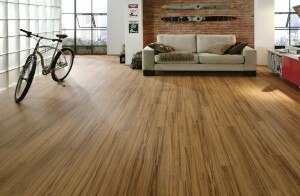 Laminate is known for great looks, affordability and durability. But each type of laminate flooring has an AC rating to it, which helps buyers understand which laminates are the most resistant to scratches and spills. AC rating is a great way to see which type of laminate is perfect for the different rooms of your home, depending on the level of traffic the room gets. AC1 is built to withstand only very light traffic in residential homes. This laminate grade is suited for closets and bedrooms. AC2 is perfect for moderate foot traffic through homes. For residential spaces that see a medium amount of wear and tear, such as a living room or dining room, this is the perfect laminate flooring grade. AC3 can handle even the heaviest foot traffic throughout homes and apartments. For high-traffic rooms, such as foyers, this laminate grade can stand up to the toughest punishment. AC3 is also suitable for low-to-moderate level commercial spaces, such as offices without heavy traffic and hotel rooms. AC4 can handle both the heaviest traffic of any residential space, as well as commercial spaces that receive plenty of traffic. For offices, as well as retail locations such as cafes, and boutiques, AC4 is tough enough to handle the stress. For the most heavily trafficked commercial spaces, like department stores, government buildings and more, AC5 is your best bet. As the most durable grade of laminate, AC5 is highly resistant and offers unmatched protection for large commercial spaces under heavy duress.